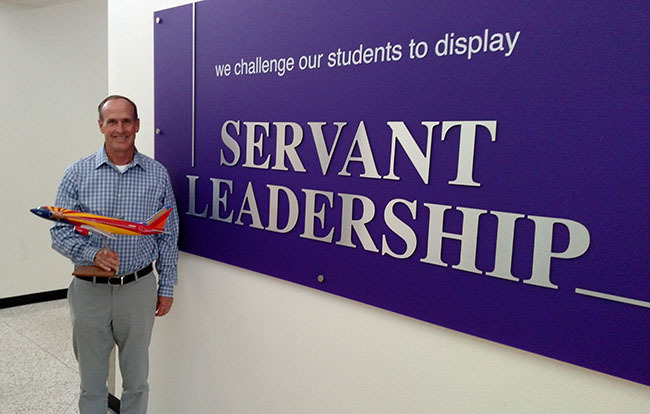 Richard Sweet told Colangelo College of Business master’s students that Southwest Airlines is built on servant leadership — and a spirited sense of humor. The loyalty to Southwest Airlines is no joke. Consistently ranked as one of the most admired companies in America, Southwest has built its reputation on low fares and a high degree of customer service — plus the announcements that flight attendants turn into standup routines. Master’s students in the Colangelo College of Business at Grand Canyon University got to hear the punchline Tuesday from Richard Sweet, who has been part of the show for 32 years, most recently as a marketing adviser. They heard about why Southwest has been able to turn a profit for 43 straight years, according to Sweet, while 58 other airlines have declared Chapter 11 in that same time period. But one thing they didn’t hear, with so much else to talk about, was the story behind the ingenious way the company mixes pleasure with business — its long-running comedy in the cabin. “There are some guidelines, and sometimes lines get crossed, but you can’t try to dictate that,” Sweet said afterward. “You’ve got to take the bad with the good because you’re empowering people to come up with new stuff. Fewer than two months ago, the CCOB dean, Dr. Randy Gibb, had done a presentation on the importance of “Conscious Capitalism,” citing Southwest as one of his examples. So it made sense to have Sweet visit and explain that philosophy from an insider’s perspective. When he first started at Southwest, though, the only thing he was conscious of was that he had a lot of baggage — literally. It was standard practice within the company to have new employees do a grunt job, so for six months he loaded and unloaded luggage. He soon had far more responsibility, at one point serving as an area marketing manager in Phoenix before moving on to the same role in Los Angeles. He continued to live in Phoenix, however; he simply flew back and forth every day, figuring that the commute was about the same as it would have been had he lived in the outer reaches of L.A., which is about all he could have afforded. That’s the other thing he stressed to students about Southwest: One way it has kept its fares low is by not letting its salary structure get out of whack. He wasn’t complaining. The company’s 50,000 employees are compensated well, he said, thanks to stock options, bonuses, profit-sharing, great benefits and a progressive culture that, like GCU’s, is built on servant leadership. The culture no doubt was the main attraction for most of the 371,202 people who applied last year for 6,370 positions. Sweet seemed rather amazed himself when he threw out those figures and shared another interesting tidbit: Candidates are brought in 10 to 15 at a time and monitored from the time they walk in the door to see how well they interact with people. But that doesn’t mean it’s all fun and games. “A lot of those 371,000 applicants think it’s enjoyable because they think it’s easy and it doesn’t come with a certain amount of stress and uncertainty and hard work,” he said. “It’s all about operational efficiency, and it’s about commitment. The focus is on problem-solving, no matter how big the challenge. Even when he’s had to work 24-48 hours straight, which happens sometimes, Sweet has come away from the experience admiring the people and the process. Gibb, who was in the Air Force for 26 years and is a regular Southwest customer, has a lot of friends who have gone on to become airline pilots. He said the ones who work for Southwest rave about the company even though they don’t get to fly the monster planes preferred by some other carriers. Who needs an Airbus when you have a work environment that soars? “It’s just the right way to run a business,” he said. Fortune has listed Southwest as one of its Most Admired Companies for each of the last 22 years, and in 17 of those rankings it has made the top 10. It is a track record that stands out, and not just in the struggling airline industry. “Servant leadership is the foundation to our success,” Sweet said. That, and some good one-liners.